Not that I’m easily swayed or anything (I absolutely am), but I thought, huh. Have I considered this opinion in the last ten years? Maybe I should rethink my stance. I’ve been doing that a lot lately, rethinking my opinions of things. It’s about this sabbatical I’m taking. (Seriously: it is.) I feel like my entire identity is up for grabs because of it. I mean, in part that’s the point. To look at everything with new eyes. Look at the world as if I’ve never seen it before. Question everything. My sabbatical involves spending three months living in London (not the one in Ontario). In order to live for three months in a foreign city, I’m going to need to pack my entire life into a suitcase, my entire identity, as it were, and go somewhere where almost no one knows me. I will be kickstarting myself. No expectations, no old rules. Everything I do will be deliberate. I’ve taken the concept of a sabbatical as a rarefied opportunity to start myself over, to decide afresh who I am and what my life is about. I know who I’ve been; without the comforting railings of the assumptions and judgements I’ve allowed to be built around me, who am I now? The first thing I did was learn to make a soufflé. I know, I know. It’s odd. I’m just going with it. So the question of perfume came up, and I decided to rethink my opinion. I did some research. I thought about it. I opted for oils over alcohol-based spray products. I discovered Black Phoenix Alchemy Lab. What’s interesting about BPAL is that what they’re doing is practically impossible. They have no bricks-and-mortar shop. They are entirely online, and they sell hand-blended, handcrafted perfume oils. How do they survive and be successful? How did something like this ever take off? How do you sell a smell over the internet? BPAL makes and sells perfume oils, but they work only from very tight concepts. Their oils are in themes, and those themes resonate very deeply with their customer base. 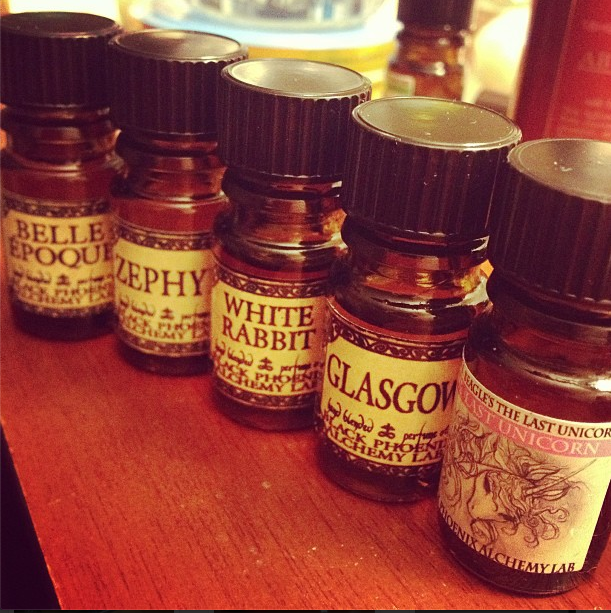 For instance: they have a series of perfume oils based on Alice in Wonderland and The Last Unicorn. These are the kinds of stories that we read when we were very young, when our senses were far more open; you read Alice in Wonderland and we can all but smell the mad tea party, the Red Queen, and the white rabbit. So BPAL creates scents in keeping with textual descriptions. The Bread-and-Butter Fly is made of thin slices of bread with butter, and it eats sugar and weak tea. (Guess what BPAL’s “Bread-and-Butter Fly” oil smells like?) They have another series called “Wanderlust,” and have created oils for a variety of cities, real and imagined. They have another series called “Sin and Salvation,” and have a perfume oil for each of the seven deadly sins. The concepts resonate, so people buy. They created a catalogue of scents, but they also created a mirror; everyone searches through it looking for themselves. People want to find scents that mark them out as the people they feel they are (or want to be). BPAL sells something ephemeral and incorporeal (scent) by tying it tightly to a strong concept, and we naturally seek out concepts that support our perceived (or aspirational) identities. I know it’s true for BPAL; you can read all the reviews of these unique scents, and lots of people will report liking the smell of one of them, but will say, “it’s not me.” They sell perfume oil, but what they’re really selling is identity markers. Identities. They are hardly the first to do this, of course: most successful businesses apply something of this identity marketing. Starbucks clearly does; they sell an experience more than they sell coffee. They sell us the opportunity to be the sort of people who sit in a Starbucks with our laptops, thinking deep thoughts and staring out the window with a tall white paper cup in our hands. They have a tight concept, and either you buy in or you don’t. But it’s not about coffee, it’s about us. There is a part of me that’s always thinking like a salesman. Not because I want to shill things, but because I see good things being misused and ignored out of habit. Things like library services, library spaces, and (let’s be honest) even librarians. They get taken for granted and misunderstood. Traditional library services, like reference, have been around for so long no one needs to justify its existence anymore. To its detriment, I feel. Good services that have a lot to offer need to be re-articulated from time to time to keep them valuable and visible. I think like a salesman in that I try to refashion the metaphors around good, solid, existing ideas in order to help people see them in new ways, and understand how to approach them. In order to help people understand how these services fit into their lives. So my fascination with selling a smell over the internet forces me to consider how what they’ve done applies to us. Libraries build identities too, don’t they? Being the sort of person who goes to libraries, who supports libraries, who thinks big thoughts and knows how to seek help and get it. The sorts of people who spend their afternoons in the library, working hard. Working with others. Finding information. Getting a good grade. that’s an identity too. How can we let our patrons use us to define themselves? How can the process of our patrons relating us to their identities help them to understand our services better? A smell, in the end, is just a smell; the concept is only its carrier. What concept is carrying library services? Does that concept resonate on such a deep level that our patrons can’t help but understand how those services are relevant to them? BPAL doesn’t cater to just one kind of person or personality. They have oils called “Old Demons of the First Class,” and “Hellfire.” In a section dedicated to fairy tales, they have one called “The Lights of Men’s Lives,” and smells like “the wax and smoke of millions upon millions of candles illuminating the walls of Death’s shadowy cave: some tall, straight, and strong, blazing with the fire of life, others dim and guttering.” They also have scents that smell like sheets hanging on a line in the sunshine. So many personalities can find their identity in that catalogue. Surely libraries are at least that rich. I have been eligible to apply for a research leave for a little while, but I never saw the appeal. I’m the sort of person who prefers to be in the thick of it, dealing with problems and issues as they happen, and feeling like my daily work makes an impact on the people around me. The idea of stepping away from work I love ran counter to my recipe for a good work experience. I was a doctoral student before I went to library school, I know how I feel about scads of unstructured time. (In a word: nervous.) So research leave really wasn’t in the cards. But then three things happened: I got taken along for a site visit to North Carolina State, I did a workshop for Mozilla in there Toronto offices, and then I went on vacation. Visiting a cutting edge, thoughtfully-designed and managed library like NCSU was very inspiring to me. Looking at how other people constructed their spaces, and how their services and spaces interacted, made a million new ideas burst from me. I saw how we could do things better, even simple things, and that services that seemed impossible weren’t. It was one of the most valuable things I’ve ever done. When I visited Mozilla’s workshop space in Toronto with my colleague Lauren Di Monte, we observed that the way they laid out their furniture had a direct impact on the way we felt sitting in their space. It changed how we interacted with technology, and made it easier for us to look at the same digital material with a group. I came back from Mozilla and reorganized my office to make a “display sharing” zone for faculty consultation. It’s been practically seamless for visitors, and 100% successful at letting us easily and simply consult with instructors over their course websites. Then, on my first ever solo vacation to London, I looked at the world with new eyes once again: I looked at the decisions people made about services, space, and technology, I thought about what they meant in the context of an academic library, and I took lessons that I then applied to my work. It reminded me that the solutions to the problems I see every day exist out there in the world, sometimes hiding as signage policies or creative uses of furniture and projection. While stepping away from the daily grind made me feel like I would be less useful, I realized that in fact the opposite could very well be true. Thus my sabbatical plan was born. At the end of December I shopped around a proposal based on these three experiences; to visit places, look at how they do things, and think hard about how they apply in our library. I was met with much encouragement and enthusiasm from all corners, so I submitted it officially in January. (Actual proposal attached below.) A couple of weeks ago I got word that it had cleared all the hurdles, and I am now officially going off for a research leave staring October 1, 2013. I have an outrageous amount of planning to do.